RH 957 (Collector Ralf Hillmann) San Lorenzo to Rio Pilaya, Tarija, Bolivia, 2800m. Altitude: 2100-4000 metres above sea level. Habitat: This cactus can be found in prepuna shrublands, in high, dry, rocky grasslands in valleys and rocky slopes of the Andes in fully exposed sites and in cliffs near rivers and riverbeds. Inhabitants must be very rugged in order to tolerate such extremes in exposure. Rebutia fiebrigii is such a robust individual. Rebutia fiebrigii is an abundant species. The population is stable because it is not exposed to any major threat. 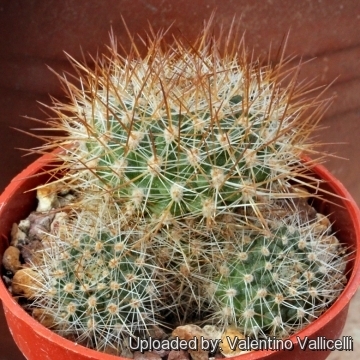 Description: Rebutia fiebrigii is a small solitary or mound-forming cactus preading out to 15 cm with white, silky, short spines and light green tubercles thickly covering the body. It is a free-flowering species with bright vermilion blooms, but quite variable. 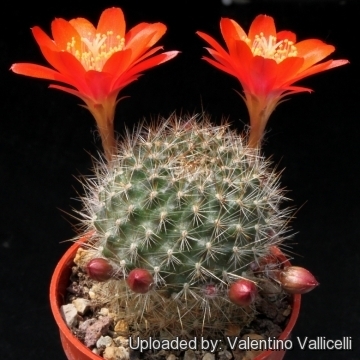 Nowadays, under the name of Rebutia fiebrigii, botanists include several different forms, that were previously regarded as independent species. 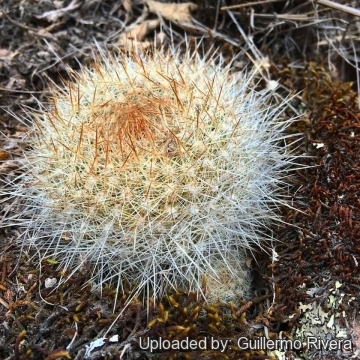 Stem: Roundish to slightly elongated, depressed at the top, 50-60 mm wide and tall, glossy green, flat, covered by distinctive tubercles similar to a Mammillaria, that are easy to see through the small spines. It grows quite close to the ground and offsets only with age. It would appear that in cultivation they grow larger and cluster more vigorously than in habitat. Tubercles: Up to 5 mm high conical. Areoles: Rather large, elliptical, white-tomentose. Spines: 30-40, all more or less similar, the central ones slightly larger, variously bristly, white, yellowish or pale brown, bristle-like, fine and soft. Radial spines:About 10 mm long, white. Central spines: 2 to 5 somewhat stronger, needle-like, to 20 mm long, light to dark brown often with brown tips. Flowers: Flowers produced halfway up the stems, curving upward, yellow, bright orange or vermilion red, funnel-shaped, 25-45 mm long, 4 cm diameter. Tube narrow 10-18 mm long, outside pale greenish to reddish, inside pale. Ovary spherical, about 4 mm wide, with small triangular scales with few white wool few white bristly hairs. Tepals vermilion red, rather rounded, often slightly serrated, 14-16 mm long, 4-6 mm wide. Filaments white, anthers golden yellow. Pistil white, with 5-6 white stigma lobes 2-3 mm long, slightly protruding the anthers. Fruit: Tiny, spherical, berrylike, about 5 mm wide, greenish-brown to purplish, with white wool and bristly, hidden among the spines, bursting when ripe. Seeds: Brown-black, about 1 mm long and 0.6 mm wide, with brownish oval hilum. 11) Lowry, M. 2013. Rebutia fiebrigii. The IUCN Red List of Threatened Species. Version 2014.3. <www.iucnredlist.org>. Downloaded on 28 April 2015. 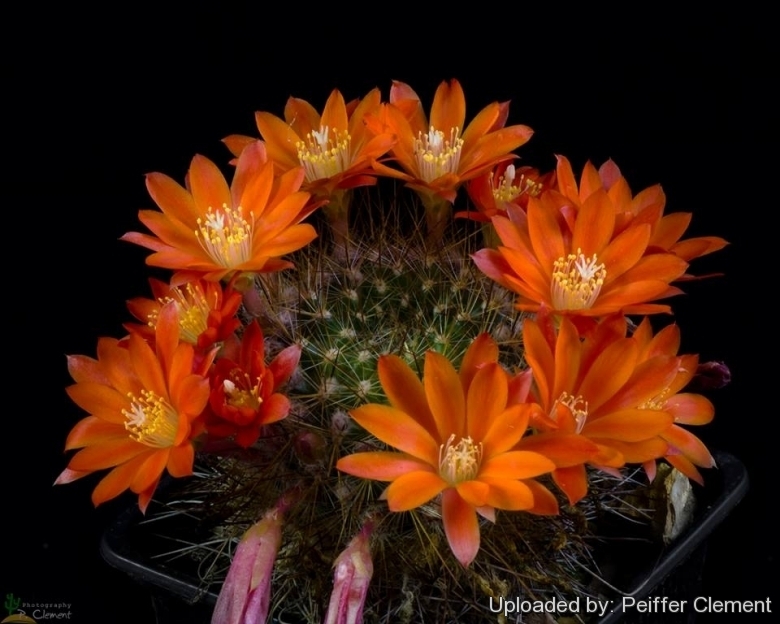 Cultivation and Propagation: Rebutia narvaecensis comes from mountainous areas, so like bright light, and cool and dry conditions in the winter. It has delightful flowers and the plants remain compact, and clumps can easily be managed by division. It is easy to cultivate and recommended for beginners.